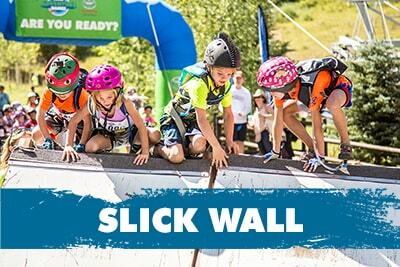 The Kids Adventure Games is a nationwide, multi-discipline obstacle adventure race for kids ages 6 to 14. In teams of two, participants compete together on bike, in water and on foot through a 2.5-4 mile course featuring up to 15 man made and natural obstacles. Races are limited to 180 teams per day. Hosted at picturesque destination locations across the country the Kids Adventure Games is more than a race, it's an event for the whole family to enjoy! To create a more active and confident generation of kids through unique, challenging experiences that teach the lifelong values of teamwork, sportsmanship, problem solving, overcoming adversity, and a joy and appreciation for the outdoors. Prizes are awarded to the top 3 finishers in each age group (6-7, 8-9, 10-11, & 12-14) and category (boys, girls, and coed). In addition, each team is eligible to win one of 3 specialty awards handed out each race day. All prizes are handed out at the after race awards party. Must be present to collect your award as prizes will not be sent to winners after the race. Awarded to the team that shows the best sportsmanship on the course not only within their team but to other teams as well. Voted on by on course staff and volunteers. Awarded to the team with the most team spirit. We encourage fun costumes, handshakes, team dances and other creative displays of spirit in this award, voted on by staff and volunteers. Awarded to the team that picks up the most trash on course. We teach the practice of leave no trace and take pride in leaving our locations cleaner than when we arrived. Trash picked up on course will be handed in and counted at the finish line to determine the winner. Parents leave the race with a huge sense of pride, joy, and sometimes surprise after witnessing their kids complete this challenging course, and overcome the obstacles within it. Your kids will have a new found confidence in their own abilities. We not only allow but encourage parents to cheer on their kids throughout the course (if you can keep up, of course), however we ask that you allow your kids to work with their partner to solve and overcome any obstacles. Please don’t physically intervene, it is after all the Kids Adventure Games - not the Parent Adventure Games. At each Kids Adventure Games event, adventure racers are invited to participate in an optional clinic to sharpen their adventure skills and increase their (and their parents’) confidence prior to the race. Skills clinics are designed to take kids of any age (6-14), gender, or athletic ability and prepare them for any outdoor, multi-disciplined event, like the Kids Adventure Games. Each of the clinics is run by our experienced clinic staff and features local experts who help build kids confidence, work on their teamwork and expose them to some of the challenges of race day. We always keep it fun, friendly, and positive. Kids registered in the Kids Adventure Games are given priority for attending skills clinics as space is limited to 60 kids per session. When possible, we add skills clinic sessions to accommodate for demand. Each location features up to 15 unique, man-made and natural obstacles inspired and built into each event venue, meaning no two races are the same. Tips and tricks for completing some of the obstacles you’ll encounter on the adventure course! Kids must register in teams of two. The age group is determined by the age of the oldest member of the team. The race categories are boys, girls, and coed in each age bracket. Start times will be announced 3 days before race day via email. One (set of) waivers per child (even siblings); available on website or made available by email in advance. The team meeting will take place a ½ hour before the WAVE start; maps are handed out and course will be revealed at the meeting by Race Director, Billy Mattison. After the meeting, teams go to line up at the start, in bib order. Course will be marked on a ‘kid friendly’ map. Course description and route will be printed on the map. Teams will start according to their age group with the oldest kids going off first; in bib order. 2/3 Teams (4/6 kids) start at a time in 2 minute intervals. Kids will travel the course by mountain bike, on foot, on land or on water. If there is a water element at the race, personal flotation devices are supplied by race organizers. Course can be a circle, a figure eight or a cloverleaf format. Transition Area is where kids will change disciplines and pick up or drop gear. There are a number of different obstacles and challenges located around the marked course, all are designed for children and are supervised by staff and /or volunteers. The tasks will not cause children any great difficulty. Each obstacle is a checkpoint. Volunteers will stamp the map as proof that the team passed by. Teams have to follow the course in checkpoint order. The course is approximately 3 miles long. This will take between 40 minutes and 90 minutes to finish. Teams must cross the finish line together. At the finish line, teams will present their stamped maps to staff and have their harnesses taken off by volunteers. All kids will wear a helmet, back pack, (bike) gloves and a climbing harness the entire course. The climbing harness will be supplied by race organizers. Spectators are welcome to watch anywhere on the course, please note some course sections may require traversing some treacherous terrain. We ask that parents allow their children to work together to problem solve all obstacles without assistance. Feel free to cheer and encourage, but refrain from physically helping. A post race party (with pizza or other food) will be held after each event for all participants. Q: Can kids compete with a teammate that is a different age? Q: Can teams be co‐ed? Q: How many teams are on course? A: Races are limited to 180 teams per race day, spread across 3 waves. Teams will be released 2 teams at a time every 2 minutes to manage course flow. Q: If my child does not have a partner can I sign my child up to save a spot and then find a partner? A: Yes, but we ask that you submit your registration as a team. Registration forms will not be confirmed until both teammates’ information is complete and payment is received. You can enter your own child’s name twice but YOU are responsible for changing this at a later date. Q: What is included in the entry fee? A: Your child’s entry fee includes an Athlete shirt, a goodie bag with treats from race sponsors, pre‐race training tips from Adventure Racer and course designer, Billy Mattison, a medal of completion upon finishing the race, an after party with post‐race refreshments. Q: What happens if there is bad weather on race day? A: The race will take place rain or shine. In the event there is lightning in the area, the Race Director will make the appropriate call to delay or cancel the race. No refunds will be given if the race is cancelled due to weather. Q: I signed up in March but something has come up and I need to cancel. Can I receive a refund? A: All cancelations received 60 days prior to race day will receive a refund minus a $25 handling fee. Any cancelations received after that date will not receive a refund. Participants must formally request a refund by completing the cancelation form on the Kids Adventure Games website. Q: May I transfer my registration to a different team? A: Yes. Registrations can be transferred to a new and different team up to 1 week prior to your event date. A $15 transfer fee will be applied on all transfers. Transfers can be completed by going to the MyEvent page provided at time of registration. Q: My child’s partner cannot compete anymore. Can they race with a different partner? Q: Can I accompany my child during the race? A: Yes, you can accompany your child throughout the race to watch them at the different challenges; however we ask that you refrain from helping/interfering with your child during the race. Course marshals will be on hand to assist if children have difficulty. The satisfaction your child will feel when finishing the race is in large part determined by the knowledge that they did it themselves. Q: Does my child need any special clothing or footwear for this event? A: We recommend kids wear moisture‐wicking clothing as they will get wet & running shoes for footwear. They will be required to wear a helmet and bike gloves throughout the entire competition. Please NO JEANS. Q: What special equipment does my child need? Light wind/rain jacket The race organization will provide a climbing harness and a life jacket if needed. Each team member must have the following gear. All items to be provided by participants and carried the entire race, with the exception of a climbing harness and life jacket, which will be provided by race organizers. Please mark your gear with your name and phone number. (Mountain) Bike with knobby tires in good working order. Please check tire pressure, brakes and make sure saddles are at the correct height. A participant can withdraw from the Event up to and until 11:59pm 60 days prior to the running of the Event they are registered in. A $25 cancellation fee will apply (i.e. I will be returned the entry fee paid by me less $25). Should I wish to withdraw from an event from 12:00am within 60 Days prior to the registered Event onwards for any reason (including, but not limited to, medical reasons), there is no refund of any portion of my entry fee. Participants must formally request a refund by completing the cancelation form found on the website. The race will take place rain or shine. In the event there is dangerous inclement weather or lightning in the area, the Race Director will make the appropriate call to delay or cancel the race. No refunds will be given if the race is cancelled due to weather.